Climate change will fundamentally affect the biodiversity of the Wet Tropics region because of the close association between climatic conditions (such as temperature and rainfall) and the distribution of growth and survival of plants and animals. 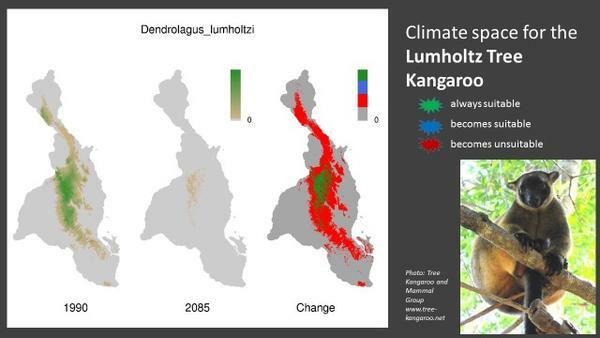 Scientists from James Cook University and CSIRO have worked with Regional NRM groups to carefully consider the likely impacts of climate change and actions needed to help plants and animals adapt to these changes in the Wet Tropics region. Unfortunately some areas of the Wet Tropics region will become too hot for the plants or animals that currently live here. In some cases, these plants and animals may be able to survive in cooler areas, such as at higher altitudes or in gullies and along streams. Scientists refer to these areas as climate ‘refugia’ as the climate there provides a refuge for plants and animals when conditions elsewhere become unbearable. It may be possible for many plants and animals to survive by moving to nearby refugia, although this depends on what these areas are being used for. Factors to consider include whether there is any native habitat, has land been cleared for agriculture, are there tough and resilient competitors and predators and is it physically possible to reach the new refuge in the first place. For some plant and animal species, there may be nowhere suitable within the Wet Tropics under future climate conditions. This is very concerning to scientists, particularly if they are endemic to the region, because it means the species is not known to live outside of this region. On the other hand, some species that do not currently occur in this region are likely to move into the Wet Tropics region if the conditions are more suitable here. In fact, on a national scale, this region is recognised by scientists as being one of the most important climate refugia for many animals that currently live in neighbouring regions where it is hotter and drier. Dr. April Reside from James Cook University provides an engaging explanation on some of the scientific methods used to understand the impacts of climate change on animals, as well as the work she has done to identify which areas will be most important for protecting the maximum number of animals in the future. Click here for a more detailed presentation of this work by Dr. April Reside. This is important information to know when prioritising where to put our greatest management and protection effort. Read more about climate change and biodiversity prioritisation. Similar research into the climate impacts on plant species in this region is not available at this stage. However, broad-scale analyses predict a general decline in the type of climate that supports rainforests and an increase in the type that supports drier forests, open woodlands and shrublands. Basically, we will be faced with new vegetation types containing combinations of species that are different to the ones we currently recognise. For most marine organisms, the increasing acidity of ocean water will have negative consequences, reducing the survival and growth rates of fish, molluscs and coral reefs. Heatwaves will also lead to more extensive and regular coral bleaching. Increasing average temperatures are already associated with a southward shift in the distribution of some fish. With rising sea levels, seawater will inundate coastal freshwater habitats, including wetlands, waterways and lakes, with enormous implications for freshwater plants and animals. Freshwater wetlands that do not tolerate saltwater inundation may be replaced by mudflat or mangroves over time. Sea level rise in combination with more intense cyclones is also likely to result in increased coastal erosion which will have a range of implications for plants and animals, including the loss of vegetation from sand dunes and headlands, as well as a loss of nesting beaches for turtles. Cyclones and extreme rainfall both cause a disturbance to natural systems. Apart from the sheer physical destruction, opening up the forest area to the light tends to favour weeds. More intense cyclones will cause more extensive and frequent damage to coral reefs and result in more regular shortages of food and other resources for animals. Flooding will result in increased runoff of soil and chemical pollutants into waterways, as well as pulses of freshwater into marine systems. Climate change is already impacting on biodiversity. Adaptation is required if plants and animals are to survive and the first step is to reduce threats such as forest clearing as this encourages weeds. It will then improve the ability of native plants and animals to adapt. We may also need to think differently about our approach to managing threats to our biodiversity. We might need to accept that the ecosystems will change and so therefore focus on helping them to continue to function relatively well, even if the species combination is a bit different from the past. As well as protecting some areas, restoration will be a critical part of climate change adaptation for biodiversity conservation, such as reforestation and coral reef rehabilitation. Relocation may be considered for highly threatened species. Changing fire regimes will be an important challenge as well as a management tool. Successful adaptation management will require well-designed monitoring to understand whether or not actions are having intended results under new climatic conditions. 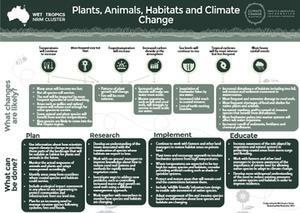 A project known as Adapt NRM has developed information about planning for and managing biodiversity under climate change in Australia. This information includes discussion of new principles for biodiversity management, as well as maps and other resources.